Comparative plans of hillforts with timber-laced walls or ramparts in the NE province from Feachem in Rivet (ed) The Iron Age in N Britain. 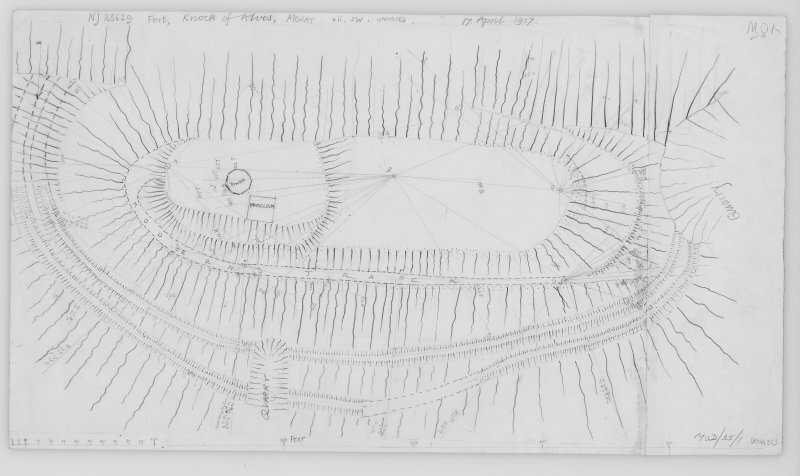 Plane-table survey: fort, Knock of Alves. See also NJ16SE 10. For York Tower and Fortreath Mausoleum (NJ 1632 6296), see NJ16SE 39. A defaced and mutilated fort, with quintuple defences consisting of three walls and two outer ramparts occupies Knock of Alves. The inner wall, now fragmentary encloses a summit area 125' by 75' in which stand the York Tower and a mausoleum (NJ16SE 39). The second wall encloses an area 415' by 75' and the third, possibly contemporary, is now almost obliterated by an access road leading up the hill. The two ramparts, 18' apart, run round the lower slopes of the hill. The remains of a fort, the only feature surviving in recognisable form being an outwork consisting of a rampart with an internal quarry ditch, with surrounds the W, N and E flanks of the hill. It is reduced to a terrace towards its E end, where it has also probably been eroded by the main access route to the summit of the hill. A track and quarry truncateit in the W.
All that survives of the inner wall described by Feachem (1963) is a mutilated scarp, only traced with any degreee of certainty in the N and W. There is no sign of stonework. Of the second and third walls described there is no definite trace and the measurement of 415ft appears erroneous. There are two or three scrub and bracken-covered scarps towards the W end of the fort but these are too vague to identify positively as artificial. There is no trace of defence along the steep, boulder-strewn and overgrown S slopes. A track leads from the summit westwards along the flank of the hill, truncates the rampart in the W, and follows the base of the rampart eastwards to a quarry about half-way along it. This is presumably the track quoted by Feachem (1963) as obliterating the third wall. A ruinous hill-dyke traverses the top of the hill from E to W.
Visited by OS (W D J) 10 December 1962 and (R L) 26 January 1972; visible on RAF air photographs 82/883 0001-2 and 106/9/Scot/UK/169 2351-2. Archaeological investigation was carried out by EUCFA in December 1997 in advance of the laying of a power cable to serve the telecommunications mast. An area of 55.5 sq m was opened; trench 1 was dug within the NW sector of the interior and trench 2 across the defences on the NW. A circular pit (measuring about 0.5m in diameter by 0.5m in depth) and a possible levelled area (containing a layer of burnt material) were revealed in trench 1. Two sherds of possible prehistoric pottery were found (one of them in the pit and the other unstratified), and a bipolar quartz flake was also found apparently unstratified. Window glass found in this trench may have come from the York Tower (NJ16SE 39). The excavation of trench 2 showed the defences to be obscured by slope-wash, root damage and animal burrowing. The inner ditch was found to measure 3m in breadth and 0.7m in depth; three layers of fill were identified. Air photographs: AAS/97/06/G10/5-6 and AAS/97/06/CT. NJ 1627 6295 A site visit was conducted to determine the least damaging route for the laying of a power cable to serve a telecommunications mast which is sited within the hillfort at Knock of Alves, near Elgin (NMRS NJ16SE 11). A trench, excavated across the defences and through the interior of the fort, identified one of the outer defensive ditches. A small pit containing a few sherds of prehistoric pottery and fragments of burnt bone was also located within the fort interior. This site is noted in the ‘List of monuments discovered during the survey of marginal land (1956-8)’, published in Vol. 1 of the RCAHMS Inventory of Stirlingshire. The 26 monuments were listed by their name, classification, parish and county, and the list also includes an indication of whether they had been planned (P), whether they were visible only as a cropmark (C), and whether they were worthy of preservation (*). Information from RCAHMS (GFG) 30 October 2012. This fort is situated on the Knock of Alves, otherwise better known as a landmark from the York Tower and Fortreath Mausoleum on its summit. 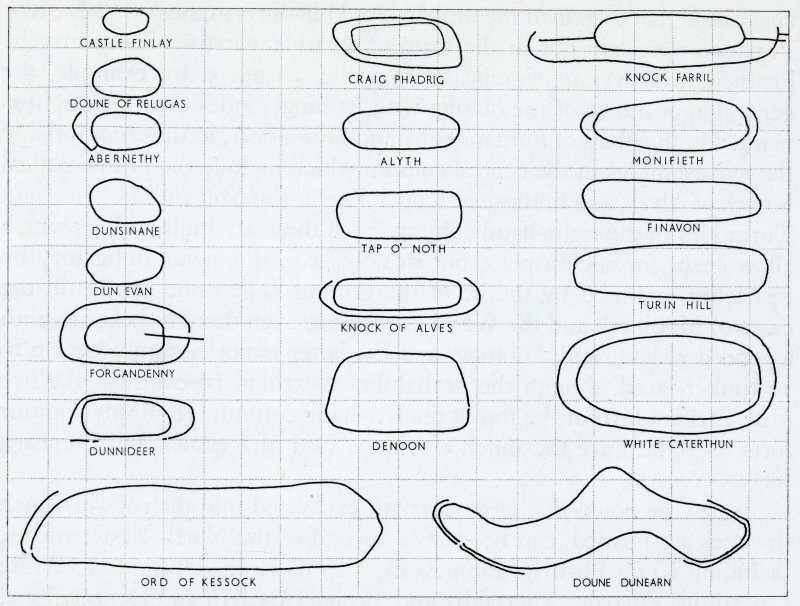 The defences probably represent several phases of construction, according to RCAHMS investigators in 1957, breaking down into three components: a smaller inner enclosure on the very summit; an elongated enclosure taking in the crest of the ridge; and two outer ramparts lying lower down the slope. Subsequent OS surveyors struggled to identify some of these elements, nevertheless, the uppermost enclosure is roughly oval on plan and measures about 38m from ENE to WSW by 23m transversely within a rampart reduced to little more than a stony scarp on the WSW and NNW, but can hardly be distinguished along the lip of the summit on the ENE and SSE. Along the N flank the rampart seems to have dismounted from this lip to follow the line taken by the inner rampart of the next enclosure, though in their dilapidated states the relationship between the two is uncertain. This enclosure measures some 125m in internal length from ENE to WSW by 23m in breadth (0.23ha), and though its rampart is for the most part no more than a stony scarp, a run of the outer face can be seen on the SW. At the WSW end there is evidence of an outer rampart, which has probably extended along the NNW and ENE flanks of the hill beneath the later access track that climbs up to the summit on the E, possibly utilising an original entrance into the upper enclosure at this end. Yet further down the slope, the two outer ramparts, which have been levelled by cultivation on the ESE but can be followed from the eastern end along the N flank and round to an old quarry on the W, probably represent yet another phase of enclosure, taking in an oval area measuring 150m from E to W by 55m transversely (0.65ha); no entrance is in evidence. Excavation in advance of a cable trench in 1997 identified a ditch associated with the outer ramparts (Glendinning 1998). NJ 1627 6295 (NJ16SE 11) As part of the Northern Picts Project surveys and excavations have been undertaken in an area stretching from Aberdeenshire to Shetland targeting sites that can help contextualize the character of society in the early medieval period in northern Pictland. In Moray we have been evaluating a series of forts in the wider environs of Burghead to attempt to construct a regional chronological framework for the development of fortified enclosures. ditch or quarry scoop contained only sterile fills.